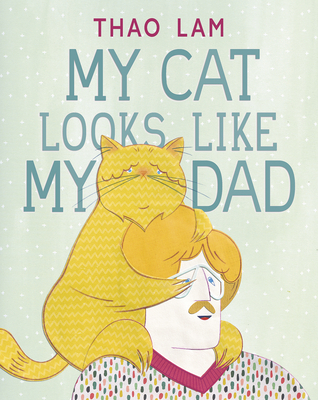 Minimal text paired with bright paper-collage illustrations create comparisons on each spread in which the narrator talks about their family--especially the striking similarities between Dad and the cat. Both have orange hair, love milk, start their days with stretches, appreciate a good nap, and are brave (some of the time). The narrator is more like Mom, with wild hair, blue eyes, and a love of dancing. A surprising twist at the end reveals the narrator's unexpected identity, also hinted at with clues in the art throughout the book. Warmth and whimsy in the illustrations add a playful balance to the story's deeper message about the love that makes a family a unit, no matter how unusual it may look from the outside.